If you have been beset by issues with your iPhone, you can always make an appointment with an Apple Genius at the Genius Bar at a nearby Apple retail location. For those that did not know, you make the appointments on Apple’s website. 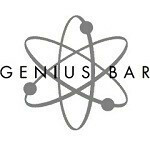 If you cannot find a link, just search “Genius Bar” and you should be on your way. As you begin the appointment set-up process for your iPhone though, you will first be greeted with a screen which requests that you try a simple reset of your device. Perhaps not surprisingly, when trying to make an appointment for a Mac, iPod, or iPad, no such admonishment is presented which leads us to believe that the Geniuses have been contending with a number of frivolous (a polite term) issues at their appointments for a while now. 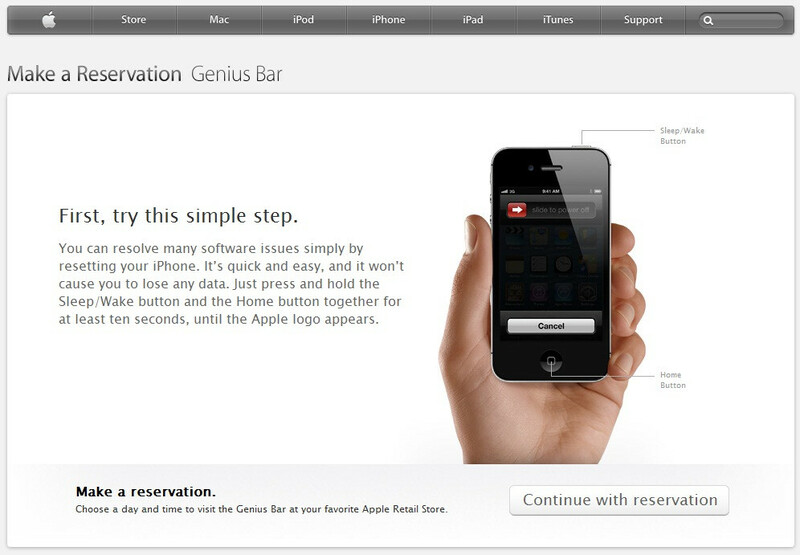 Of course, there is nothing stopping you from clicking the “Continue with reservation” link without doing anything. For those that do not know, resetting your iPhone is akin to performing a battery-pull on a BlackBerry, or forcing your PC to shut down after hitting CTRL-ALT-DELETE. Simply hold the home button and the sleep/power button together for about 10 seconds, or until you see the Apple logo on the screen. Or, you may have a crush on one of the Apple Geniuses and you need to make appointments to see him or her. Send flowers instead. Though it's got nothing to do with this article, I really wanna ask when phonearena will actually build a mobile version view? I read RSS feed from like 20 tech sites everyday and everytime I see something interesting that I wanna click in to check out the full story, yet when I see it's a phonearena page I normally just don't even bother clicking on the link because it's not only harder to read unless I use the reader mode, but also it's just got way too much stuff to load in the page... It's such a popular site and heavily focused on mobile devices, why doesn't it even have a mobile mode? Just saying..
@eggimage, phonearena's mobile site is already up there, but for some reason it does'nt open up automatically. If you want to visit mobile version of phonearena then simply type 'm.phonearena.com' on your phone's web browser, without the quotes. I like that they use the term "reset" they know they wouldn't want to say "Have you tried restarting your iphone?" Resetting the phone, even a simple power cycle, can sometimes fix some issues. iPhans usually flip out if something isn't working right and instead of looking for a quick fix themselves, they call into customer service, or Apple, freaking out and all it takes it a quick reset.